Neck and shoulder pain is a common problem of many people, especially after a long day at work. Neck and shoulder pain is actually not something so serious, but it is so annoying to feel such every day. You have got to get to know these best exercises for neck and shoulder pain. 1. Poor Posture: either sitting in front of a TV watch a favorite movie or sitting in front of a computer working all day, when you position your head wrong, it could make you feel the pain from neck and shoulder easily. 2. Mental Stress: Constant holding on of stress at work is another common cause of neck and shoulder pain. Once you start feeling the tension from the areas, it is important that you should take a rest, out of your computer. The following simple exercises are too useful. Until you feel a little bit better, you could go back to work. If not, you will carry the pain back home and every day. 3. Neck and shoulder Incidents: for some people, they encounter some injuries due to certain incidents that create pain over their neck and shoulder. If that is the case and you feel the pain is abnormal, it might be a good idea with visit your doctor. However, a few simple exercises could help you release the pain from neck and shoulder well. You could get to know those best exercises for neck and shoulder pain, and you could feel a little better anywhere and anytime you start to feel the tiredness of the neck and shoulder. Head tilt is a simple exercise you could try it even at work once you start to feel the stress over your shoulder and neck. Two minutes of this exercise could give you a good relaxation over the neck and shoulder. How – Start with finding a nice, comfortable place to sit and relax. You could even do it on your desk chair. Nonetheless, if you could find somewhere else, have a kneeling position and rest your arms comfortably at both side. You then may stack your head over your shoulders and breath in and out slowly a few times. You could then start lowering your left ear to the left shoulder while slowly moving your head around to lower your right ear to the right shoulder before returning to the top. You may try this several times. You could also press it a little bit if you feel needed, to release the tension for the many small muscles over the areas. This could help a lot. Even something like a shoulder shrug could help you feel way better. You can start trying a shrug exercise once you feel tired over the neck and shoulder. Simply, you could find a comfortable place to sit and try the shrugging exercise. You could do it slowly with breathing in and out. To do this, you could push your both shoulders up while lowering your neck and head down. Once the muscles are pressed to each other, it helps strengthen and release the tension out of the muscles. 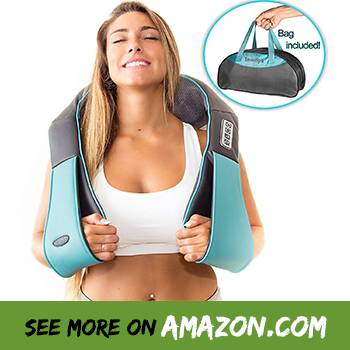 As a result, it will bring a little more of relaxation to your neck and shoulder. Also very simply, when tension is built over your neck and shoulder, a little bit of massage over the shoulder and neck will make you feel the difference, and that could be done anywhere anytime, whether you are at work or at home. To do it, you may start with the right hand dropping over your left shoulder. You could use your arm to squeeze the muscles around your left shoulder gently a few times. And, you could start again with your left hand to the right shoulder. Doing the same things gently a few times will help release tension from the areas, making you feel a lot better, surely. Likewise, instead of gently squeezing the shoulder area, you could tap it lightly too. You may watch the following video for an easy instruction. As mentioned above, some tiredness and tension over the neck and shoulder area could be caused from mental stress at work. And, this is a very common habit of many people at this modern age. When it comes to mental stress, a simple meditation technique could help a lot. Basically, according to my experience, it is when our mind keeps thinking and thinking, worrying and worrying that we feel the stress and anxiety. This shakes up our body and create a kind of negative sensation in certain parts of our body such as over neck and shoulder. Find a good, silent place to sit back and relax. Start breathing in and out slowly. Focus on the breath. You know it is breathing in, and you know it is breathing out. You start to observe the breath, and you know it is coming in and it is coming out. Gently and camly, you try this same thing for a few minutes. You will start to think less, and your mind will start to relax accordingly. Little by little, the tension and negative sensation will start to be lighter and lighter, and you will then feel better and better. This technique is so simple and could be used any time, and it is found very effective. Wingspan is another one of the best exercises for neck and shoulder pain, and the how is so simply as descripted below. Start firstly with the kneeling position if you could find a good place, if not, sitting over a chair is as well okay. Chin up and look straight in the front. Reach your right palm to the back from the top and reach your left palm to the back from the low side. You could press it a little bit to put a good pressure over the muscles. 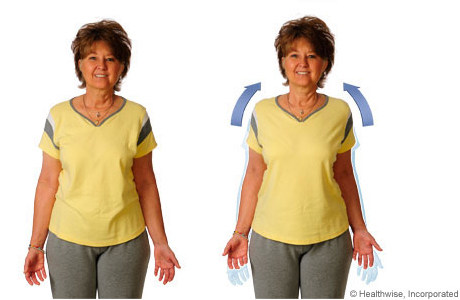 And, then you could alternate your left arm to the top and your right palm to the lower side. Both palms reaching each other or not is not that important. You may try this for a few minutes each time.